I now had to decide how to tackle Vilnius, the Capital of Lithuania. I didn't want to miss it but I also didn't want to stay at a big city campground or in a crowded hostel. And cycling in and out of Vilnius plus sightseeing with a fully loaded bike in one day seemed too complicated either. But then I had the idea to do it as a day trip from Trakai which turned out even better than expected. I camped close to Trakai and cycled in in the morning arriving just as the tourist information opened. Equipped with an accommodation list I started my search and found the perfect place close to the bus station. The old landlady did not speak a single word of English and about 5 words of German but we quickly came to an agreement. I got a very colourful room with toilet and shower on the same floor for only 40 Lits which is about 12 €. My bike was safely locked into the laundry room and I even got a tiny threadbare towel. 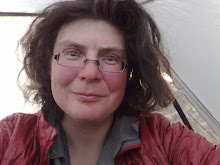 I jumped under the hot shower and delighted in washing my hair before setting off to the bus station around the corner. Lithuania is a small country and maybe this is why the buses are so small, too. But the minibus was on time and in 40 minutes I was in Vilnius - for 1,60 €. 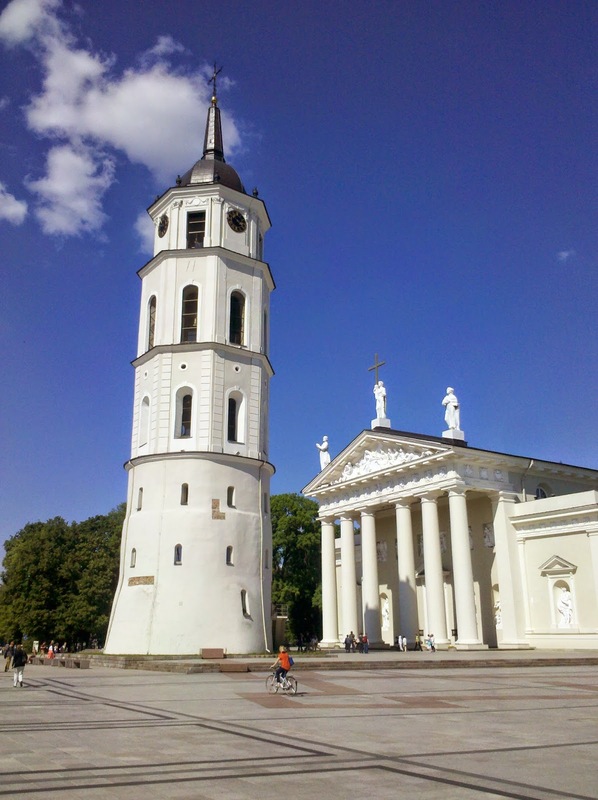 I had always thought that Spanish towns do have a lot of churches but Vilnius beats them all. 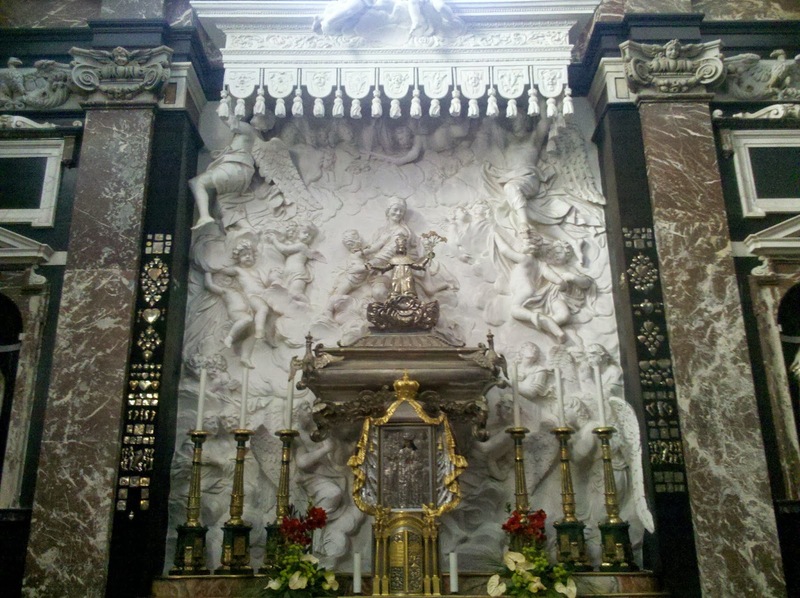 The reason for the huge amount of churches is the number of different ethnic groups in Vilnius - here Catholics, Protestants and all sorts of Orthodox Christians had to be catered for. 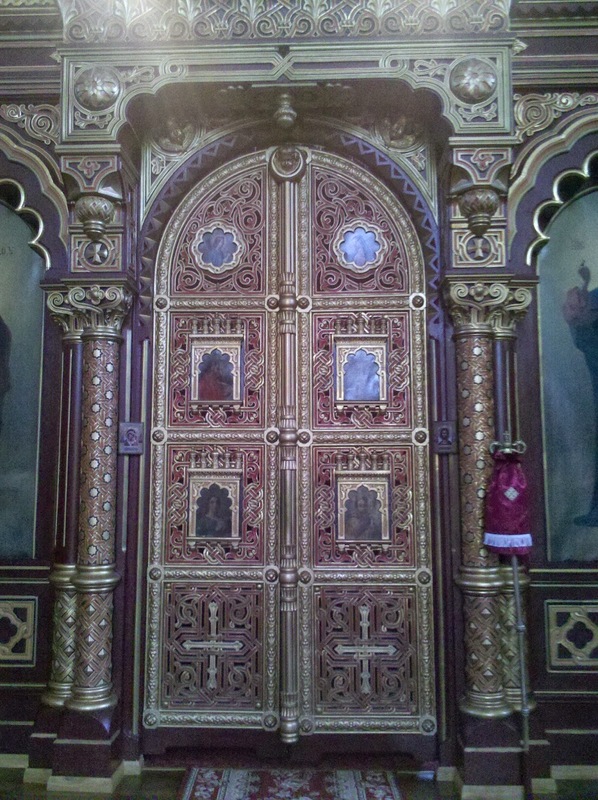 I hadn't known that there are so many different varieties of Orthodox Christians.... And before the Holocaust Vilnius had also been a Jewish centre with a number a synagogues, one of which has been rebuilt. The sheer number of churches in the centre was stunning, and of course I visited them all. Beside briefly visiting a small and rather commercial amber museum (the Baltic area is the world's biggest producer of amber - it is actually mined in the Russian territory) I focused on one very interesting but rather gruesome museum: the KGB museum, or its official name Museum of Genocide. 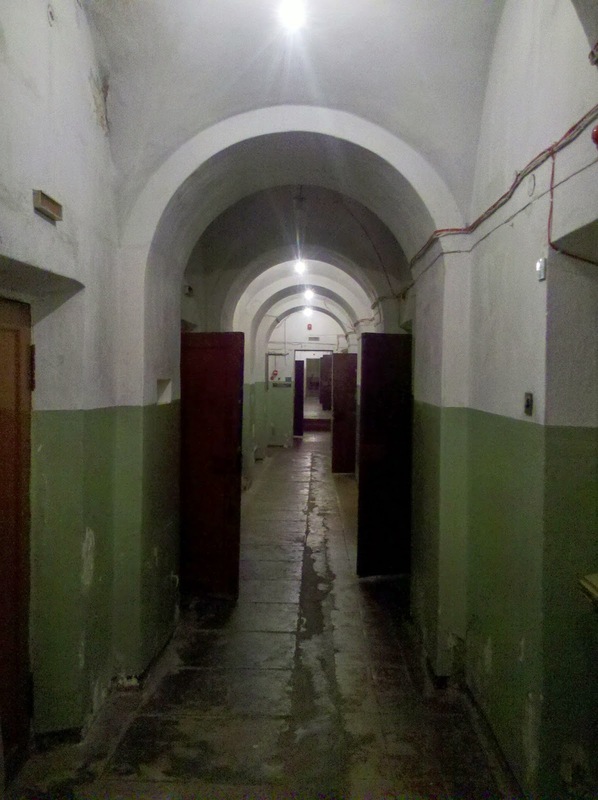 The museum is housed in the former KGB headquarters in Vilnius were the former cells can be visited. More than 1,000 people have been killed inside this prison and in the execution chamber a respective video is shown that gives you goose bumps. Afterwards you know why the Russians are not very much liked in the Baltic States. In the adjacent exhibition you learn about Lithuania's struggle for independence - Russia's brutal repression ranging from killing dissidents to sending them into forced labour to Siberia. The museum was very moving and I recommend it highly as a must if you want to understand Baltic-Russian relations. When the museum closed I sat outside on a bench to digest what I had seen and another visitor from Poland felt very similar - we ended up talking for quite a while. But my day in Vilnius didn't end that depressing. I spoilt myself with a restaurant dinner! I had seen a vegetarian restaurant and could not resist the temptation. The music in the restaurant had very limited lyrics: "Hare Krishna", so I guess I had ended up in a Hare Krishna restaurant but the food was good. Happily I strolled back to the bus station and was swiftly brought back to Trakai in another minibus where my landlady and my quirky room were already waiting for me. I had really liked Vilnius but this one day had been enough. I felt I had seen everything I wanted. And that meant I did not have to cycle through Vilnius but could go around it the next day - a very happy prospect. 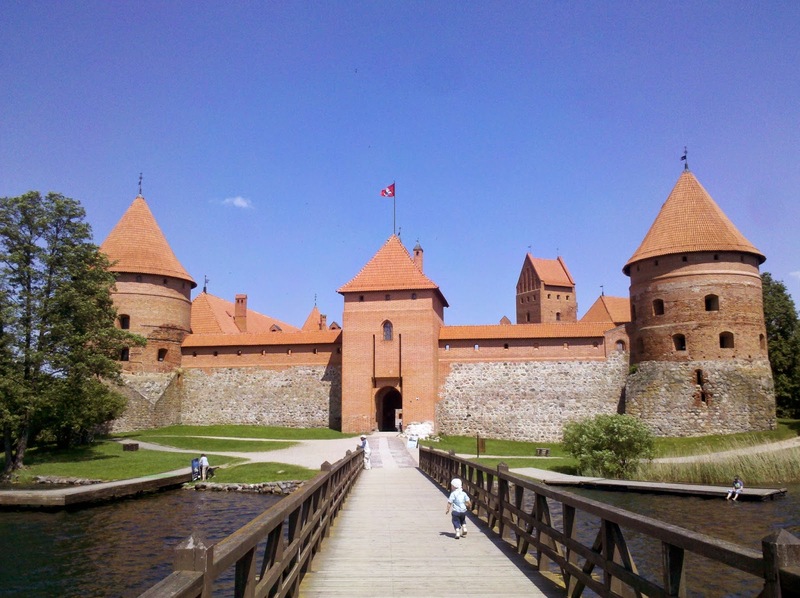 I therefore slept in and then set off to see the main sight in Trakai, the famous castle on an island in the lake. The place is incredibly touristy and was full of school classes. Although quite nice I wasn't too impressed with the castle or maybe the school classes were too much getting onto my nerves... Still, my stay in Trakai and my daytrip to Vilnius have definitely been a highlight of this trip so far.